After several revisions of the self-assembling Zack II beach shelter, the next step up from the base model emerged – the Zack Premium pop-up beach shelter which has some very valuable additional features so you can enjoy beach fun even more. The highlights are 3 new windows, which can be securely closed and opened outward. When closed, you are protected against wind, sand and sun seeping in. You can open or close their windows according to the position of the sun and the wind direction. When open, it is protected by a particularly fine mosquito net to prevent unauthorized access by the animal kingdom and or by fine sand. In addition to the classic tent pegs, the Zack Premium pop-up beach shelter also comes with special V-profile sand pegs made of steel to anchor your Zack Premium securely even on fine sand. Four sand bags give the tent even more traction when needed. The material corresponds to that used for extreme rain. As a pleasant side effect, this increases the water column. You can order the Zack Premium blue at Amazon. Of course, the Zack Premium is also equipped with a top-quality sun-protection coating. Just as last year, this was confirmed to us by the Hohenstein Institute. 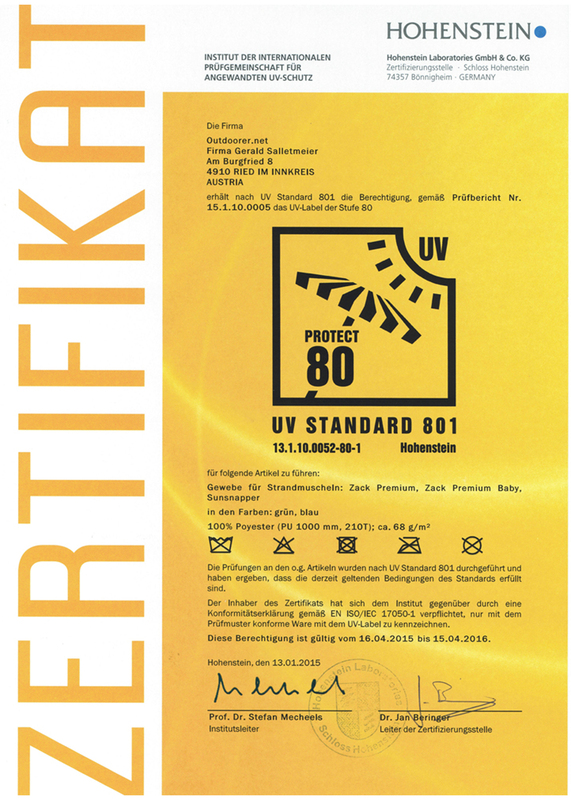 Our beach shelter is certified as UV80 according to UV Standard 801 (valid with windows closed). The base itself and the linkage mount are particularly robust and resistant thanks to a special Oxford polyester. This is also used for the transport bag it. 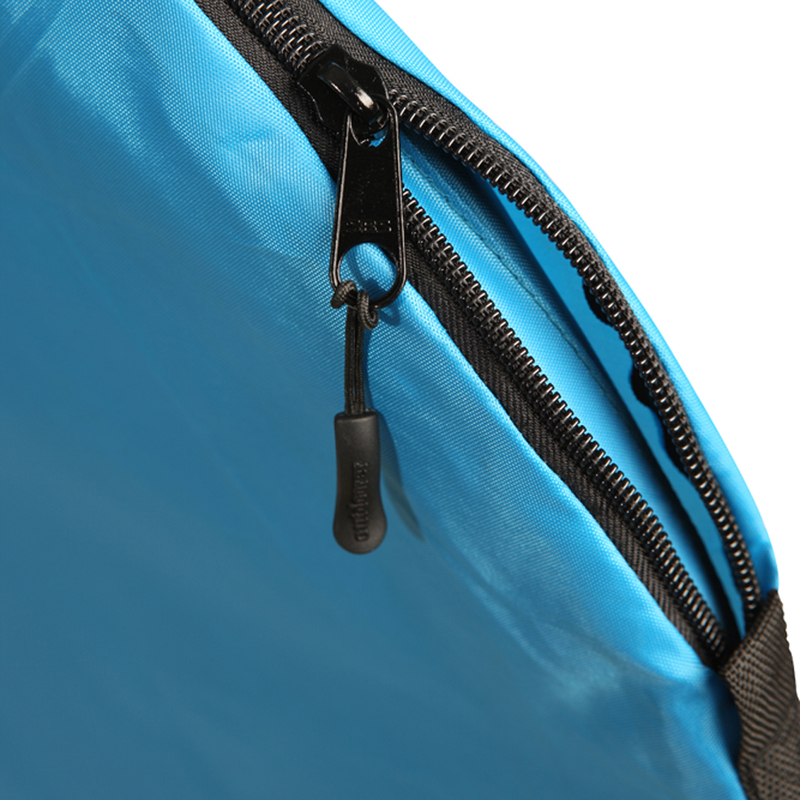 Additionally, Outdoorer uses an SBS-brand zip. 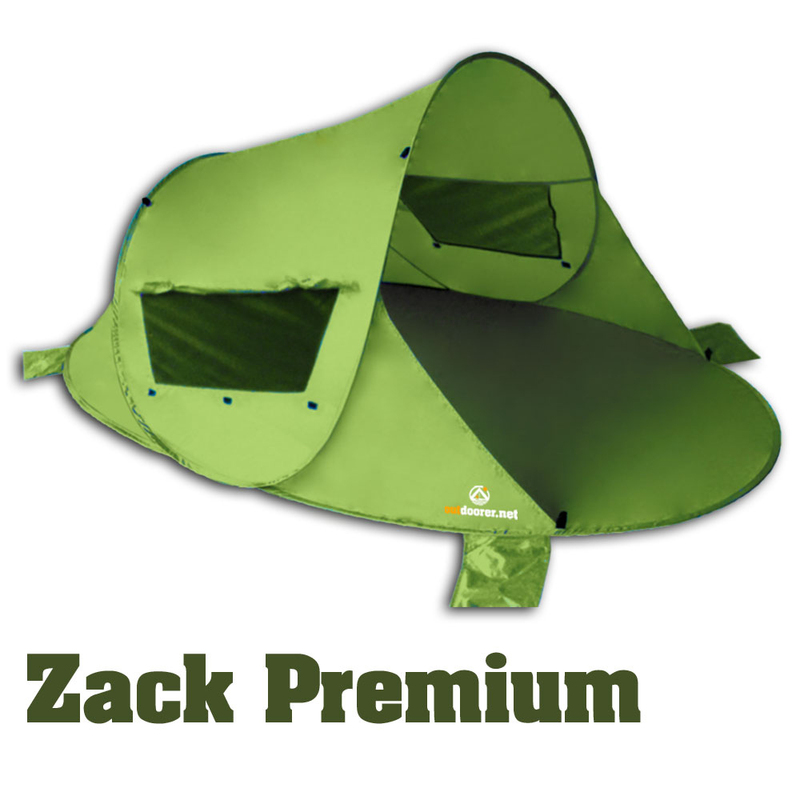 The Zack Premium is also available in apple green. 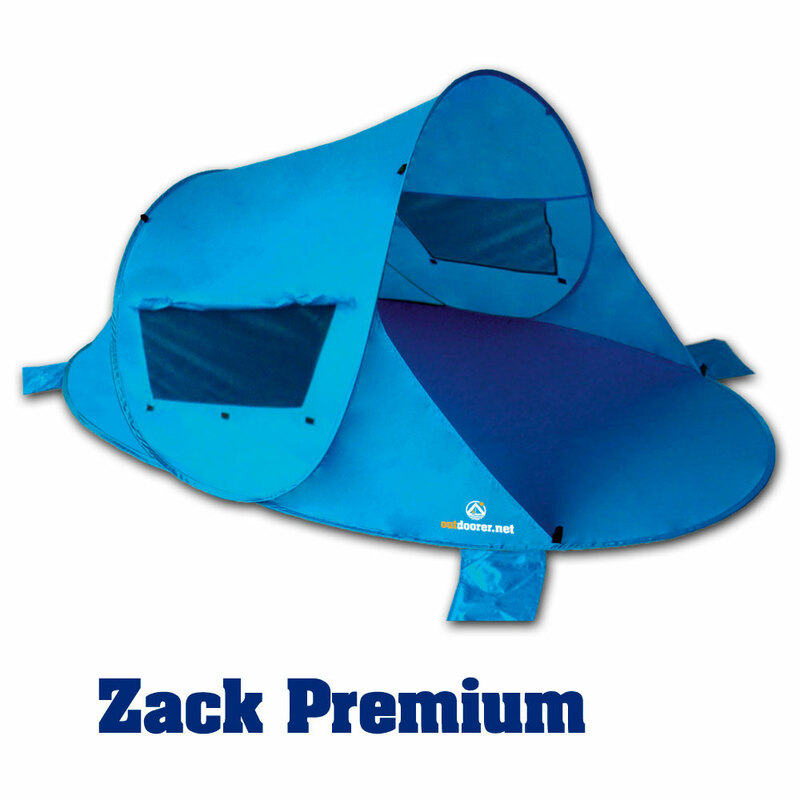 Where to purchase the robust Zack Premium pop-up beach shelter? You can order the Zack Premium in blue or green via Amazon. Treat yourself but your throwing Zack beach shelter Premium resistant to soil protection. This prevents small cracks caused by stones, branches or other similar items in the bottom of the shelter beach. It also protects well from dirt and moisture. You can find all information here. 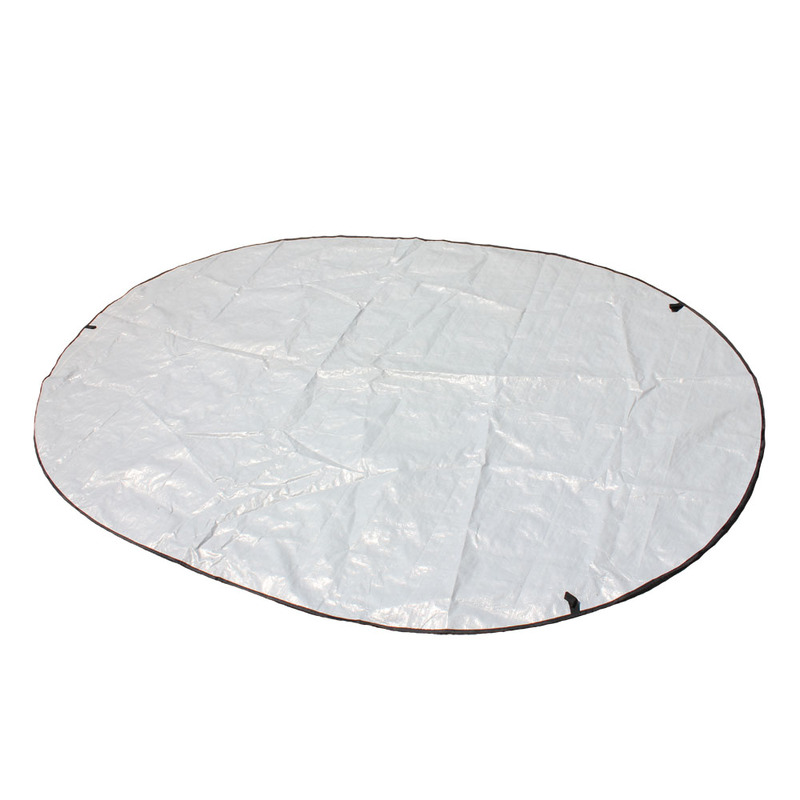 Watch our new dismantling instruction for the pop-up beach tent Zack Premium.